Hollowing out the handles of long, round-handled instruments decreases the overall weight. This makes them efficient and non-fatiguing when operating under a microscope. The round shape of the handle also makes these surgical instruments easier to manipulate during surgery. 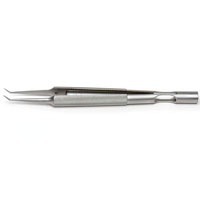 Made from high quality stainless steel, these instruments are an excellent addition to a microsurgical instrument kit.